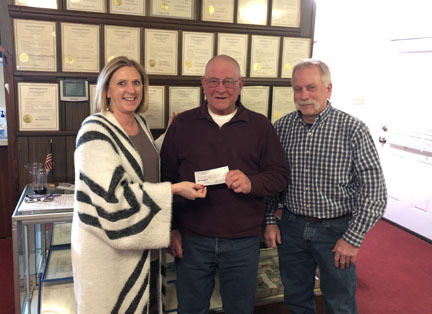 Home News Community Interest Defiance Merchants Association Donation to Augusta Fire Dept. The Defiance Merchants Association recently donated $500 to the Augusta Volunteer Fire Department. The money was raised during the Defiance Merchants Assoc. Christmas Festival– from parade entry fees and general donations collected throughout the day. AVFD Chief Bob Struckhoff said most of the funds were used to purchase a new chain saw for the brush truck at station #2. “We appreciate the DMA’s support,” he said. John Freeman of the Augusta Volunteer Fire Dept.